The 2nd Battle of Smolensk continues with a massive cavalry battle on the right half of the field. At 1600hrs, Marshal Murat pushed forward his reserve Heavy Cavalry corps made up primarily of Cuirassiers. This move was to counter the Russian's move deploying their Cuirassier divisions and Guard Heavy Cavalry in support of their Grenadier and Guard Infantry divisions being deployed along the road heading south toward our positions. On the Russian left of their heavy cavalry, they still had Dragoon brigades threatening the advance of my Italian corps onto the field of battle from the road running East to West on the right of the French lines. I had managed to deployed my Italian Cavalry division along with a French Light Cavalry division that Murat had attached to me, but my infantry was having a hard time getting the room to deploy to be of any use. I needed to push the Russians back in order to bring my combined arms into play. My problem was that if I pushed too far forward with my light cavalry, I could easily grab the attention of the Russian Cuirassiers which were way more than a match for my troopers. Timing was important. I had to give Murat time to bloody their nose with his armoured horse to my left. The situation at 1600hrs. My 1st infantry division deploys just south of the East-West road while my Italian cavlary cover their right flank and threaten to engage Russian Dragoons. 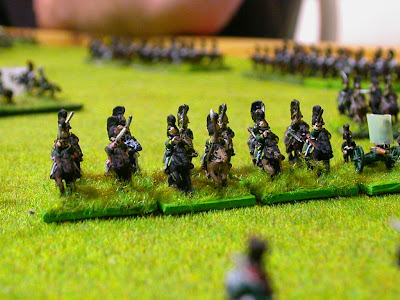 Further to the right is my attached French cavalry threatening more Russian Dragoons. In front of my Corps can be seen Murat with his Cuirassier brigades deployed and then the Polish moving forward with the Vistula Legion behind them. Further behind in the photo can be seen the original position in the hills behind the village and river and the village on fire as our Westphalians and Russian infantry fight hand to hand to gain control of it. Murat was keen to get to grips with the enemy horse. He ordered his leading Cuirassier brigades closest to the Italian's on his right to attack the enemy before them. Both brigades thundered forward as the enemy horse countercharged. The 1st brigade of Cuirassiers met their counterparts and immediately were locked into a heated hand to hand fight which produced no real winner for a long time. As the 1st contact was yet to be decided, the 2nd brigade of French Cuirassiers charged their enemy who met them in the middle of gap and clashed swords as well. This 2nd engagement was decided quickly. As the battle continued to their left, the 2nd brigade of Russians were repelled and fled for their lives. With a threat of French Cuirassiers recovering unchallenged in the middle of the cavalry fight, the Russian Commander broke off a regiment of Guard Cavalry to the right of his Cuirassiers and caught the rallying French Cuirassiers in the flank, destroying half of 1 regiment and forcing the other to flee to the rear. The Russian Commander claps with glee and moves the remainder of his Guard Cavalry up to fill the position. These formations are now in line with the advancing Grenadiers and threaten the Polish columns and the 2nd line of Murat's Cuirassiers. On the right flank of the French side, my Italian Corps is threatened by multiple brigades of Russian Dragoons and artillery denying me space to deploy my infantry. My time was ripe. I could see the French Cuirassiers locking in the nearest enemy Cuirassiers with a 2nd enemy formation on the run behind them. Now was my time to clear away the Dragoons. Being attached to the Italian Guard Cavalry, reinforced with my Italian Dragoons, was able to get a sudden charge on the most southern enemy Dragoon unit which actually contacted them on their flank, taking them totally unaware. The enemy horse are destroyed and the surviving flee in panic. I spur my horsemen forward to break through the enemy lines and find another Dragoon formation to my front, also unaware of my efforts. At the last moment they discover their threat the withdraw just in time to deny me of coming to grips with them. Not deterred, I continue forward with my wave of horses and men and a 3rd Dragoon unit also flees before I can draw their blood. Although denyed more blood, I am happy with my charge and pull the reins in and signal to the trumpeters to hold and rally on the spot. I had cleared away 3 of the 4 enemy Dragoon regiments and a battery of guns, leaving just 1 more regiment and the flank of the Russian Cuirassier 2nd line exposed. Seeing my efforts, one of the attached French light cavalry brigades takes the opportunity to charge the remaining enemy dragoon regiment and convincingly forces it to flee in panic also. The whole flank is now open for me to capitalise. The French Hussars continue forward on their success and contact one of the fleeing Dragoon regiments from my charge. The regiment is destroyed from the rear. Marshal Muart and regained his composure and personally led a whole division of French Cuirassiers forward to engage the Russian Guard cavalry opposing them. The clash of the heavy cavalry. Murat with a division of French Cuirassiers engage Russian Guard cavalry. The Cuirassiers fail to make an impact and soon the whole division turns and flees. The Russian cavalry continue their countercharge after routing our Cuirassiers and it is not long before their long and awkward formation clips the edge of the Polish infantry and in particular 2 batteries of guns who try valiantly to defend their guns only to have 1 battery destroyed and the other routed. With the guns gone, the Russian line lumbers forward and hits a square of fresh Polish infantry, detirmined to stem the tide of Russian horse. They succeed and the end most regiment of Russian horse break and flee. Now that the Russian Guard cavalry is spent and separated a little, a nearby brigade of Westphalian and Polish cavalry take the opportunity to present a front and move into the gap the Cuirassiers left just as the Russian horse come to a stop. 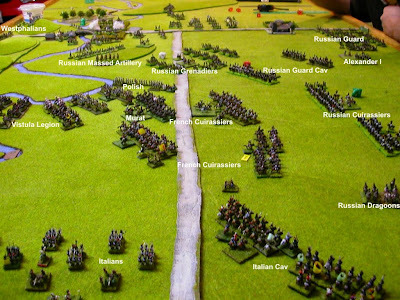 As all this plays out, Russian Grenadiers charge forward and engage the front of the Polish column. A volley of musket shots is absorbed as they lower their bayonets and push into the line of Polish. They reach their target and violent hand to hand fighting ensues.